Conrad Grebel. Artist's concept painted by Oliver Wendell Schenk, 1972. Conrad Grebel (ca. 1498-1526), can be considered the chief founder of Swiss-South German Anabaptism. Much less widely known than Hans Denck or Balthasar Hubmaier, he is nevertheless historically of much greater significance, for without him Anabaptism in its historical form would probably never have come into existence and he represents original Anabaptism in the form in which it has been perpetuated to the present day, whereas Denck and Hubmaier represent sideward movements from the main stream, both of which diverged significantly on major points and both of which soon died out. Grebel was viewed as the outstanding leader of original Swiss Anabaptism (properly called the "Swiss Brethren" movement) by his enemies, as well as his followers. Zwingli viewed him as the head of the new heretical faction in Zürich. In January 1525, just after the break with what was destined to become the Anabaptist group, he wrote to Vadian, "Conrad Grebel and a few other less important persons are holding fast to their standpoint." In a letter to Oecolampadius and others in November 1526, shortly after Grebel's death, Zwingli referred to Grebel as "the ringleader (coryphacus) of the Anabaptists." Johannes Kessler of St. Gall, in his famous Reformation diary, Sabbata, calls Grebel the arch-Anabaptist (Erzwidertouffer). And the records of a very important disputation, held in 1538 between the evangelical preachers of Bern and the Bernese Anabaptist leaders, the minutes of which still lie unpublished in the state archives in Bern (labeled Unnütze Papiere), indicate that the Brethren counted Grebel as the "first Anabaptist" (der erste Täufer). Conclusive evidence of Grebel's position of leadership in the founding of the Anabaptist movement comes from a highly interesting account of the actual birth of Anabaptism which tells us that Grebel performed the first adult baptism in Zürich on the night of 21 January 1525. The story found its way into the remarkable manuscript chronicle of the Hutterian Brethren, known as the Geschicht-Buch. In that account of the epochal meeting in the house of Felix Manz, when 15 brethren were gathered in prayer after the mandate of the Zürich council proscribing the further propagation of their faith, we are told that as they arose from prayer, moved by the Spirit of God, George Blaurock asked Conrad Grebel to baptize him on the confession of his faith, thus recognizing Grebel as the spiritual leader of the little company. This Conrad Grebel did, performing the first adult baptism in Reformation times, the model for millions of similar baptisms since that day. The attempt to trace the career, theology, and significance of Conrad Grebel is severely hampered by scarcity of sources. His was a short life (ca. 1498-1526) with scarcely three years of public activity of a sort sufficiently important to bring his name into public records or into the private correspondence of contemporary leaders, and all that is said of Grebel in both of these sources could probably be written on less than three typewritten pages. The only writing of any sort which he prepared for publication—a brief pamphlet of less than five thousand words—has been lost, and can with difficulty be only partially reconstructed from the translated quotations found in Zwingli's counterattack in the Elenchus. Three relatively insignificant short poems have been preserved, and one short petition for safe conduct to the Zürich council in 1525. Fortunately, 69 letters written by Grebel (as well as three written to him) have been preserved. They were written between September 1517 and July 1525, two to Ulrich Zwingli, one to Thomas Müntzer, one to a co-worker named Andreas Castelberger of Zürich, nine to Oswald Myconius of Lucerne, and 56 to Grebel's close friend, former teacher, and brother-in-law, Dr. Joachim von Watt, the reformer of the Swiss city of St. Gall, commonly known as Vadian. Most of these letters, however, were written during Grebel's student years at Vienna and Paris, and throw practically no light on the important phase of his life as Anabaptist leader. The three letters to Grebel which have been preserved include one from Benedikt Burgauer (1523), a minor evangelical preacher of St. Gall, one from Erhard Hegenwalt, a young evangelical friend in Wittenberg (1525), and one from Vadian (1524). One book of Grebel's library has been preserved in the state library in Zürich. Conrad Grebel was born about 1498 as the second of six children to Junker Jakob Grebel and his wife Dorothea Fries. For a century and a half the Grebel family had been one of the leading families of the city of Zürich, one of the small number of wealthy patrician families of the lesser landed nobility who had for years directed the political, economic, and military affairs of the city. The family had always had one or more members in the city council and usually furnished the guild-master for one of the aristocratic merchant guilds. Grebels had frequently served as magistrates, and for two generations before the Reformation no important political event took place in Zürich in which a Grebel did not have part. The most influential of all the Grebels was Jakob Grebel, Conrad's father, a wealthy iron merchant, who reached the peak of a successful career in politics in the first years of the Reformation. From 1499 to 1512 he served a double term as magistrate (Vogt) of the territory of Grüningen, and from that time on served as a representative of the canton of Zürich at practically all of the meetings of the Swiss Confederacy, as well as serving frequently as plenipotentiary in important Swiss and foreign negotiations. Jakob Grebel's family also played its full part in the patrician social life of the city of Zürich and northeast Switzerland. The daughters married prominent men, one becoming the wife of Vadian, noted humanist professor and sometime rector of the University of Vienna, later burgomaster and reformer of the city of St. Gall. The two sons of Jakob Grebel, one of whom died young, were given every advantage that wealth and prestige could bring them, one (Andreas) becoming a courtier in King Ferdinand's court in Vienna, and Conrad being sent to the best universities of the time, Basel, Vienna, and Paris. At the height of prestige, fate struck the family heavy blows. The only surviving son, Conrad, became an Anabaptist heretic, dying as an exile in 1526, while the father was executed in disgrace a few months later on the charge of receiving foreign pensions. However, the family name survived, the sons of Conrad being reared by his surviving relatives in the Reformed faith, and Grebels continued to be prominent in the affairs of Zürich. A grandson of the Anabaptist Conrad, also named Conrad, became treasurer of the city in 1624, and the latter's grandson, another Conrad Grebel, became burgomaster in 1669. A recent member of the Supreme Court of the canton of Zürich was Dr. Hans von Grebel. His son, Hans von Grebel, was in 1954 serving as pastor of the Grossmünster church in Zürich. Perhaps H. Richard Niebuhr is right in asserting in his book The Social Sources of Denominationalism that the Anabaptist movement was a movement of the socially and economically oppressed lower classes, but it is difficult to apply this theory to the founder of the movement, Conrad Grebel, the wealthy, socially elite, university-trained patrician son of an unusually successful father. Conrad Grebel probably grew up in the castle at Grüningen, a few miles east of Zürich, where his father was magistrate during Conrad's boyhood days. His education must have begun in the Latin School of the Grossmünster church in Zürich, known as the Carolina because it was supposed to have been founded by Charlemagne. Here he received the typical Latin training of the time, quite in the old-fashioned scholastic spirit. His university career began in October 1514, when he matriculated for the winter semester at the University of Basel, which was at that time in a very low state, with an average of 50 new matriculants each semester. The newer humanism was just beginning to come in. Glarean (Heinrich Loriti), the outstanding Swiss humanist of the younger school, had just come to Basel and established a bursa, or boarding academy. Since all the students of the philosophical faculty were required to live in one of the numerous bursae, Grebel joined Glarean's bursa. Fortunately, Glarean was an excellent teacher, and under his tutelage the young Grebel was introduced for the first time into the world of humanist learning and living. Basel was barely beginning to come into its glory as a humanist center. Erasmus had come two months before, in August 1514, to remain through the winter. The great Froben had begun his career as an independent printer the year before. Beatus Rhenanus had been there since 1511, Hans Holbein the Younger came possibly during the winter of 1514-15, Oecolampadius came in 1515, Amerbach, Fonteius, and other lesser humanist scholars were already occupied as proofreaders in the great printing houses. The growing humanist life was just organizing itself, the foreigners gathering around Erasmus and Rhenanus in the famous Sodalitas Basiliensis, while the lesser Swiss group gathered around Glarean. It was in this latter group that Conrad Grebel moved during the first semester of study, probably scarcely aware of the significance of his environment. Before he could enter fully into this new life, his father transferred him to the University of Vienna, where he had secured a four-year stipend for him from the Emperor Maximilian. A constant stream of young Swiss students, particularly from Zürich and eastern Switzerland, had been flowing to Vienna for the preceding five years, partly under the influence of Ulrich Zwingli, who had himself studied there in 1501. The center of the Swiss student group in Vienna was Vadian, a famous Swiss humanist professor from the city of St. Gall, who took it upon himself to become the friend and patron of the Swiss boys. Vadian had been in Vienna since 1510, had a doctor's degree in medicine as well as philosophy, was a noted humanist poet, crowned poet laureate in 1514 by the emperor, was appointed professor of rhetoric in 1516 as successor to the great Angelo Cospi, and the same year elected rector of the university. 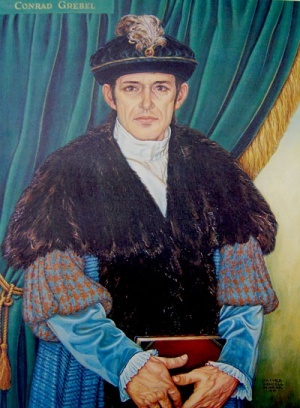 When Conrad Grebel carne to Vienna to enroll as a student in the summer of 1515, to remain for three years until June 1518, he naturally became a part of the Swiss group gathered around Vadian. Indeed, he soon became an intimate friend and protégé of the great professor. The warmth and intimacy of this friendship is eloquently attested by the 56 extant letters written by Grebel to his "dearest teacher and most faithful friend." Vadian encouraged and promoted the young student in every possible way, recognizing in him outstanding gifts and a splendid personality well qualified for future leadership. He seems to have counted him as the most promising of the Swiss students. Out of this friendship came good fortune for Vadian, for it brought him in the summer of 1519 Conrad's younger sister Martha as wife. When Vadian suddenly left Vienna in June 1518, partly because of the plague which was raging and partly because he had decided to exchange a professorship in Vienna for the life of a physician and scholar in his native St. Gall, Grebel went with him. However, he remained in Zürich but a short time, for his father had secured a royal scholarship from the king of France for his son—one of the two which were being granted annually by Francis I to each Swiss canton—and in September he set out for Paris on what was intended to be the climax of a successful scholastic career. There he spent two further years, certainly in study, although the rather inadequate matriculation records of the university do not contain his name. He went to Paris with high hopes, being particularly happy again to join the bursa conducted by his former Basel teacher, Glarean, for the latter had conducted a bursa for Swiss students in Paris since 1517. But the high hopes with which Grebel came to Paris were not to be fulfilled. After three months he became involved in a serious quarrel with Glarean and left him, not to return until an entire year had passed. And in July 1519 a severe plague broke out in Paris which drove Grebel and his friends away from the city for six months. His troubles were further increased when he became involved in several student brawls. He also suffered somewhat from illness due to his loose living, and finally his father, becoming incensed at reports he had received, cut him off from funds. Even Vadian threatened to break off his friendship and practically ceased writing. Under the blows of fate and circumstance Grebel lost heart and returned home to Zürich, his high hopes disappointed, without having completed his studies or secured any kind of degree. It was the end of his student days. He determined to seek a reconciliation with his parents and Vadian, and hoped for some career in his home city, although his self-confidence had been badly shaken and his inner life was full of conflict. For almost six years Conrad Grebel was a student among the humanists of the universities, and it is of importance to inquire the significance of his training. His chief teachers were Vadian and Heiligmaier at Vienna, and Glarean and Nicholas Beraldus at Paris, of whom Glarean and Vadian alone exerted a significant influence upon him. It is true that in Paris Glarean counted in the circle of his friends the great Budaeus and Faber Stapulensis, but there is no evidence of any sort that Grebel came into contact with them or was influenced by them. Alike in Paris, Vienna, and Basel, Grebel's contacts were primarily with the newer type of transalpine literary humanism, which characterized the better Swiss, French, German, and Austrian humanists. While this humanism was not the immoral, pagan Italian type, it was also not the Christian humanism of the Erasmian type. Vadian and Glarean were solid, stable scholars, whose chief concern in life was to promote the liberal arts, to write poetry, to study geography, mathematics, and natural history, and to enjoy the fellowship of like-minded spirits. They were not greatly concerned about a moral and religious reform of society, for they had not yet been caught in the growing tide of interest in the great Christian Renaissance which Erasmus was promoting with ever-increasing zeal. This is the type of humanism to which Grebel was exposed, and which is reflected in the numerous letters which he wrote to Vadian and Myconius (one to Zwingli) during his student days. At the university he learned Latin, Greek, and probably Hebrew, learned to write Latin well, to appreciate the great classic writers and scholars, but failed to acquire any new religious concerns or attitudes. He did not become a pagan, for he retained his traditional faith in the church and her dogmas, but neither did he become an Erasmian reformer. If Conrad Grebel ever acquired a humanistic interest in the Erasmian type of reform of religion—which is more than doubtful—it could have come only during the late months of 1520 and 1521 after his return to Zürich. There he sought and found fellowship in the little group of returned students and humanists who gathered with Zwingli to study Greek and Hebrew during the early years of Zwingli's ministry in Zürich; but he found little satisfaction in this activity. At odds with his father, he finally decided to leave home to seek a career as a proofreader in Basel. But this project likewise did not succeed, and after two months in the printing establishment of Cratander in Basel (August and September 1521) he returned to Zürich, hoping to break down the bitter opposition of his parents to his proposed marriage with a girl below his social status. Failing in this, he suddenly went through with the marriage in February 1522, during one of the frequent absences of his father from home. The break with his family was complete, and was only partially restored by the mediation of one of the city pastors, an associate of Zwingli. During this period of stress and strain, lasting a year and a half, Grebel may have been influenced by Zwingli's more religiously motivated type of humanism, but there are no traces of such influence in his correspondence during this period. As we come to the close of Grebel's humanist period, and see that it made no evident contribution to his religious life or thinking, it may be worth while to point out that this conclusion seriously militates against the theory of the humanist origin of Anabaptism which has recently gained ground. Certainly Conrad Grebel did not become an Anabaptist because he was a humanist. If in the minds of some scholars Anabaptist theology and ethics seem to reflect somewhat Erasmian humanistic Christianity with its emphasis upon Sermon on the Mount ethics, the Erasmian influence certainly did not enter Anabaptism through Conrad Grebel, the founder of the movement. The year 1522 marked an epoch for Conrad Grebel which was to lead to a transformation of his entire life. Unfortunately, there is a hiatus in his correspondence for nine months during this vital period, but from the middle of the year 1522 it is evident that Grebel was a changed man. Now he was deeply interested in the progress of the evangelical cause in Zürich; he became an ardent partisan of Zwingli and his reform program. The spirit and atmosphere as well as the content of his further correspondence are so radically different from what they were before that we must believe that a genuine conversion and renewal of life took place during the spring of 1522. The explanation is not far to seek. Grebel was won by the powerful Gospel preaching of Ulrich Zwingli, as many other citizens of Zürich were. From the beginning of his career in Zürich in 1519, Zwingli had carried through a strikingly new program of expository preaching covering many of the books of the New Testament. Like the learned and respected canon, Heinrich Engelhart, who through Zwingli's preaching confessed that he was "changed from a doctor of Roman law to a poor scholar of Christ," Grebel was changed from a loose-living humanist university student to a devout and earnest Christian. Henceforth until his untimely death in the summer of 1526—four short years ahead—he was in the forefront of those who were bringing in the new era, first for a year and a half as an enthusiastic supporter of Zwingli, and then for over two years as the founder of the new Anabaptist movement. As Zwingli from 1522 on gradually swung into a program of practical reform in Zürich after having laid the foundation through four years of preaching, Grebel went with him. Almost at once he was a leader in the devoted group of younger men who joined Zwingli's side in the conflict. Zwingli recognized and valued Grebel's support and permitted him to publish a vigorous poetic ode hailing the Reformation in his booklet entitled Archeteles which was published in August 1522. In October of that year Melchior Macrinus of Solothurn wrote to Zwingli that he had heard that Grebel had developed into an exceptional promoter of the Gospel, a fact which gave Macrinus great joy, for such gifted and learned young men could render the Gospel and the world a great service. During these months a very close friendship developed between Zwingli and Grebel. Zwingli apparently planned to have Grebel appointed to the university or the theological school which he expected to establish. (The theory that Grebel broke with Zwingli, as claimed by Emil Egli and others, because the latter refused to give him the desired appointment is contrary to fact.) A few years later, after the break, Zwingli was very bitter over the broken friendship and complained of ingratitude on the part of Grebel for whom he had done so much. The close relationship between Grebel and Zwingli was maintained until the second Zürich disputation of October 1523. In this period the views of the two men must have agreed in all essential respects. For instance, in the matter of tithes, one of the burning issues of the hour, Grebel indicated agreement with Zwingli. During this time he also formed a fast friendship with Felix Manz, young Zürich student just returned from Paris, who had joined the ranks of the Zwinglians, and who was to become in January 1527 the first Anabaptist martyr in Zürich. Beginning, however, with the October 1523 disputation, a cleavage arose between Zwingli and Grebel, which gradually grew wider during the ensuing months, until in the fall of 1524 it led to a complete break. It went so far as to cause Zwingli to condemn Grebel and his friends publicly from the pulpit as "Satans going about as angels of light," while Grebel responded by condemning Zwingli and his assistants as false shepherds not true to the divine calling and the divine Word. The October disputation was called to put pressure on the city council to institute immediate reforms in the church life of Zürich by abolishing the mass and doing away with images. Zwingli made valiant speeches during the disputation urging this very thing. But when he saw that the slow-moving city fathers were not ready for such a radical step, he beat a strategic retreat. When Grebel observed the change of front, he at once openly protested and demanded that the city council should not be allowed to decide the matter, since all were agreed on what the Word of God required. But Zwingli would not break with the council. As a matter of fact, the mass was not abolished by the council until May 1525, almost two years later. During all the intervening time Zwingli and others continued to officiate at a ceremony which they had publicly condemned as an unscriptural abomination. This strange compromise was a heavy burden on the conscience of many devout Zürichers, not only of Conrad Grebel, to whom it seemed as though the Word of God was being set aside and made subordinate to the action of a political body. Here then was the issue: should the civil state continue to dictate the faith and life, and worship of the church, or should the pastors and laity themselves carry through the necessary reform in church life according to their God-given convictions? Fundamentally, the issue was whether the new evangelical movement was to eventuate in a state church under civil control as before, or in a new type of free voluntary organization. Both Luther and Zwingli, as well as the other reformers, faced this fundamental issue, and decided to continue the medieval state church with a predominant control by the civil state in the life and faith of the church. Perhaps it was a wise and statesmanlike decision, but in terms of absolute principle and plain Scripture teaching it was indefensible. At least so it seemed to Conrad Grebel. Conrad Grebel and his friends went home from the October disputation shocked and dismayed, feeling that they had been betrayed by the leader whom they trusted. Zwingli, on his part, bearing the burden of actual responsibility, sensing the strength of the Catholic opposition, could not help viewing his critics as irresponsible young radicals who had not yet learned the lesson of patience. The difference in point of view cut deep, and during the winter months an earnest and serious debate was carried on between Zwingli on the one side, and his former friends and supporters on the other, particularly Grebel, Manz, and Stumpf. According to Zwingli's own testimony, these men came to him repeatedly with the proposal that he set up a new kind of voluntary Christian church, one composed of true believers only, willing to live a life of true righteousness before God and man according to the teaching of Christ and the apostles, and in which a Gospel discipline would be maintained. This new church would be freed from state control, although its members would endeavor to secure a true Christian membership on the city council so that the latter would support and not hinder the work of the church. For months the struggle continued, Grebel hoping against hope that Zwingli would adopt this program, for apparently there had been some discussion of these principles earlier, with Zwingli not at all averse to them. (In 1523, for instance, Zwingli had been willing to abandon infant baptism.) But Zwingli had made up his mind that he would not follow the new plan. He feared the consequences. Would there be enough true Christians to carry on the church, and what would happen to the unregenerate mass of nominal Christians? Grebel wanted absolute loyalty to the Word of God regardless of consequences. And he was willing to accept the consequences in his own personal experience. Those who held to Grebel's position and joined him in the break with Zwingli—a small company of not more than 15 men—did not rush into precipitate action. They met frequently for fellowship and Bible study, Grebel and Manz expounding the Scripture from the Greek and Hebrew text. They meditated, prayed, and waited. But while they waited they sought to find allies outside of Zürich. In this seeking Grebel took the lead. In the summer of 1524 he wrote to Andreas Karlstadt, who apparently had broken with Luther on somewhat similar grounds as Grebel had with Zwingli. And in October Karlstadt himself appeared in Zürich for a short time, obviously to see whether he could establish himself with the Grebel group in a new program. But the bitter opposition of Zwingli, together with the evident weakness of the Grebel group, as well as possible differences of program, no doubt convinced him of the impracticability of the move, and Karlstadt faded out of the picture. Meanwhile Grebel had heard of another Lutheran preacher who had apparently had a break with Luther—Thomas Müntzer of Altstedt in Saxony. Here might be a possible ally. He secured two of Müntzer's booklets, in which he found much that was good, and some that was bad. But on the whole Müntzer seemed promising. So in September 1524 he wrote to Müntzer in the name of his little group, encouraging him to continue in his opposition to Luther, but warning him of several false steps he was making. (The latest and best edition of this exceedingly important document is to be found in H. Boehmer and P. Kirn, Thomas Müntzers Briefwechsel, Leipzig, 1931, pp. 92-101. The only English translation appears in W. Rauschenbusch, "The Zurich Anabaptists and Thomas Münzer" in American Journal of Theology 9, 1905, 91-105.) Before the letter was sent off, a Zürich friend returned from Saxony with the information that Müntzer was apparently ready to use violence to promote his program, and on the other hand seemed to be unwilling to dispense altogether with the ancient forms of worship of the church which had no basis in Scripture. So Grebel added an appendix to his letter, chiding Müntzer and expressing concern lest Müntzer should turn out to be a disappointment to those who were dissatisfied with Zwingli and Luther and wanted a true reformation and reconstruction of the church according to the Scripture alone, doing away with all mere customs and traditions of men. Grebel's fears were only too well founded; Müntzer, too, proved to be a broken reed. However, even the hoped-for contact with Müntzer was never established, for Grebel's letter never reached Müntzer, but returned to Grebel and was apparently turned over upon his death to Vadian in St. Gall, where it is found today among the Vadian manuscripts in the St. Gall library. Some scholars have erred in supposing that this letter proved a community of faith and practice between Grebel and Müntzer; it actually proves the opposite. Müntzer probably died without ever having heard of Grebel and his group in Zürich. Later enemies of the Anabaptist movement, following the lead of Heinrich Bullinger, have insisted that Grebel and his friends frequently visited Müntzer during the Tatter's brief visit to Basel and southern Baden in November 1524, two months after the above-mentioned letter was written. But there is not the slightest evidence of this. Zwingli never mentioned such a visit in his extensive attack on the Anabaptists, and certainly he would not have failed to connect them with Müntzer's revolution if he could have done so. The legend of the connection of the two is a pious fraud, a pure invention on the part of Bullinger, who was anxious to clear the name of his beloved Zürich from the stain of the Anabaptist heresy and was glad to be able to assign the origin of the movement to an outside source in faraway Saxony. It is worthy of note that Grebel also wrote to Luther in the summer of 1524, receiving no written answer but the assurance through a mutual friend, Erhard Hegenwalt, that Luther was not ill-disposed toward Grebel and his group. Having failed to establish any outside contact, Grebel and his group were forced to rely upon their own resources. The closing months of 1524 were full of increasing conflict for them. Open threats from the pulpit, as well as private warnings, made it all too plain that suffering and persecution awaited them. In a touching letter to his friend Vadian in December 1524, Grebel indicates his fears for the future and his determination to press on unflinchingly upon the course he felt God wanted him to follow. He says, "I do not believe that persecution will fail to come. . . . By their fruits ye shall know them, by persecution and sword. . . May God give grace; I hope to God that He will grant the medicine of patience thereto, if it is not to be otherwise . . . and may peace, faith, and salvation be established and obtained" (Vadianische Briefsammlung, III, 97). The final break came over the question of infant baptism, although this was in reality merely a reflection of the major issue, which was that of the character of the church. The issue was whether the church was to be a universal organization including the entire population by birth and infant baptism as heretofore, or whether it was to be an organization composed of adult believers only who were prepared to assume the full obligations of discipleship. It was Zwingli and not Grebel who forced the issue in a bitter determination to root out the opposition to his program. The first refusals to baptize infants occurred in the spring of 1524 in the parish of Wilhelm Reublin, and were not due to Grebel's influence. However, Grebel certainly sympathized with the objectors and without doubt supported them. Zwingli and the council sought to win the objectors to infant baptism by private discussion, but the objectors asked for Scripture proof that infant baptism was commanded, which of course could not be given, and all the devious and specious arguments which Zwingli and his fellow pastors used could not move these simple-minded Biblicists from their fundamental position. It was clear that only vigorous action, including the use of the force by the state if necessary, would suffice to quell what Zwingli called rebellion (Aufruhr). So the decision was made to hold a public debate on 17 January 1525, to be followed by a decree of the council on the matter. The story of the debate and its outcome is familiar history. As leader of the dissenting group, Grebel played a major part, assisted by Felix Manz and George Blaurock. The outcome was two severe council mandates of 18 and 21 January 1525, ordering a complete cessation of activity by Grebel and Manz and their associates, forbidding the Bible study meetings of the group, and ordering immediate baptism of all unbaptized infants on pain of exile from the canton. The final break was at hand. Grebel himself had an unbaptized daughter two weeks old who, as he said, "had not yet been baptized and bathed in the Romish water bath," and whom he did not intend to baptize. No sooner was the issue raised than the answer was given. The Grebel group would not compromise under any circumstance, for their consciences were bound by the Word of God as much as Luther's was at Worms. They felt that they had taken a Scriptural position which had not been refuted from the Word of God by Zwingli and the city council. The Word of God was to be trampled underfoot by the brutal power of the state. Already on the next day after the first mandate Zwingli knew the outcome, for he wrote to Vadian on 19 January, "Grebel persists in his stand." When the little group of Brethren met for counsel to determine their course of action, probably on the evening of 21 January, they had no program of introducing rebaptism. In fact, such a thing had never been mentioned in the entire course of the struggle. But in a moment of inspiration by what they confidently believed was divine guidance, adult baptism was introduced in this little meeting, with Grebel performing the first baptism, as related earlier in this article. This was the birthday of Anabaptism. The story of the Anabaptist movement from this point on is familiar. The little group that had met on the evening of 21 January 1525 went out from their meeting with a sense of divine mission and endowment upon them. Fearing neither Zwingli nor the council, they went from house to house and into the towns and villages of the countryside teaching and preaching and urging men and women everywhere to join them in their new fellowship. The response was remarkable. In spite of repeated arrests and fines and imprisonments, the movement grew. Apparently it was not to be stopped. By Easter time Balthasar Hubmaier and practically his whole parish in Waldshut had been baptized with three hundred adult participants, and in St. Gall Grebel had great success, so that about five hundred were baptized at one time. In consternation the Zürich council called upon the other cantons of Switzerland to help to stamp out the heresy, for it was spreading to St. Gall, Appenzell, Grisons, Aargau, Basel, Lucerne, Bern, in fact everywhere. Despairing of lesser measures, Zürich finally, in November 1526 established the death penalty by drowning for participation in the new movement. This example was followed widely within and without Switzerland. The movement was checked and soon limited to but a small number of families in scattered places, chiefly in the Emmental near Bern, although as late as 1700 there were still a few Anabaptists left in the Zürich countryside. The strict Zürich mandates made it almost impossible for Grebel to stay in the city, where he was well known, and carry on an aggressive program. Leaving the work in Zürich to less known coworkers, he set out on a mission to surrounding cities to win pastors and leaders to his cause. Several weeks in February 1525 were spent in Schaffhausen where it appeared for a time as though he might win Sebastian Hofmeister, the city pastor. Forced to leave the city, he returned to Zürich for a secret visit. Then followed a call to St. Gall about Easter time, where one of his associates, Wolfgang Ulimann, whom he had baptized in the Rhine near Schaffhausen in February, was having remarkable success, and where he also perhaps hoped to find at least toleration at the hands of Vadian. After a successful mission there he returned to the neighborhood of Zürich and spent most of the summer preaching with considerable success in the territory of Grüningen just east of Zürich, working much with the village pastors. In October 1525 he was taken captive together with Manz and Blaurock and put in prison in Zürich on an indeterminate sentence; but by good fortune the entire group escaped in March 1526, after six months' imprisonment, and at once resumed their preaching activity. During the winter in prison, Grebel evidently succeeded in preparing a brief defense of the position of the group on baptism in reply to the arguments advanced by Zwingli. He had tried during the summer before to accomplish this and to find a printer, but was frustrated in his intentions. It seems that after his escape from prison he succeeded in finding a printer and circulating a small number of the booklets. No copy is extant, but Zwingli attempted to refute the booklet in detail in his Elenchus which was published in July 1527. Worn and weary, in ill health from the long imprisonment and the hardships he had been compelled to undergo, Grebel sought to find a safer field of labor and possibly the rest and quiet which he so sorely needed by going to the region of Maienfeld in the canton of Grisons, where his oldest sister had been living for some time. There is no record of his movements or activities in this region, except for the brief statement in Kessler's Sabbata that shortly after his arrival in Maienfeld he died of the plague. Nothing is known of his burial place, nor of the exact time of his death, although it must have taken place about July 1526. He did not die in prison as Neff and others have claimed. Zwingli considered his struggle with the Anabaptists in Zürich 1524-27 a desperately serious conflict. As early as May 1525 he wrote his friend Vadian that all previous conflicts (referring to the Catholic opposition) were as child's play compared with this one (Zwingli Werke VIII, 332). The seriousness of the conflict was due not so much to the number of the Anabaptists as to the power of their ideas and the conviction with which they were held. What were these ideas of Conrad Grebel and his associates which Zwingli feared and with which he differed so radically? In the first place, they were not ideas referring to the major classic Christian doctrines. It can be said without contradiction that on the cardinal points of Christian theology Zwingli and Grebel agreed, for the former declared that the Grebelites differed from him only on unimportant minor points. In his Commentario de vera et falsa religione (Commentary on True and False Religion) written in March 1525 he says, "But that no one may suppose that the dissension is in regard to doctrines which concern the inner man, let it be said that the Anabaptists make us difficulty only because of unimportant outward things, such as these: whether infants or adults should be baptized and whether a Christian may be a magistrate" (Zwingli Werke III, 872). Zwingli was, of course, mistaken in his judgment that the issues involved concerned only unimportant things, but he was right in denying that the issues concerned the inner aspect of Christian faith or experience. Grebel and his brethren were consistent evangelicals. If we take at face value Zwingli's statement that baptism and magistracy were the chief points at issue, we see that the deeper issues involved were those of the nature of the church and the relation of the Christian to the world. These are of course major theological points. Grebel's doctrine of the church was substantially that held by the modern nonconformist churches, particularly the Baptists and the Mennonites, and he was the first to hold this position. According to Grebel, the church as a local body comes into existence through the preaching of the Word and its voluntary acceptance, and through the consequent conversion and renewal of life of individual believers. By faith the individual members are united together and incorporated into the body of Christ. This church is in truth a fellowship of brethren in life and suffering, a communio sanctorum, which is maintained by the inward bond of faith and the outward bond of love. When a member of the body fails to maintain love toward the brethren or does not order his life according to the Gospel, he breaks the bond of fellowship, and if he will not hear the church and repent and change his life he must be excluded from the fellowship of the believers. New members may be received into the church only upon a confession of faith and separation from sin, upon evidence of a renewal of life and a walk in holiness. The government, ordinances, and activities of the church must be based solely upon the express teaching of the Word of God or the example of Christ and the apostles, with the rigid exclusion of "opinions of men" (a Grebel expression found in his letter to Müntzer, by which is meant a complete break with medieval tradition and a return to the apostolic pattern of the New Testament). In the second major point, that of the relation of the Christian to the world order, Grebel and his followers occupy a unique position in the history of Protestant doctrine, a position which has not been followed by the nonconformist groups to any extent, and which probably only the modern Mennonites hold. Luther, Calvin, and Grebel alike condemned the world order as sinful and in need of regeneration, but the three assumed radically different attitudes toward the condemned world order. Luther held that it was futile to do much to change it, and that since it was a necessary evil which one could not well escape, the Christian must compromise with it, participating as necessary in its life and institutions, and finding solace from the conflict by a retreat to the inner life with its experience of the grace of God and the forgiveness of sins. Calvin took the opposite position, namely, that the Christian must not compromise with the world, but must seek to regenerate the world order and make it Christian and thus make the will of God sovereign in all human life and institutions, even though that might mean the forcible suppression of ungodliness. Unfortunately, Calvin relied too much on the Old Testament in addition to the New for the content of the will of God, from which the pattern for human society was to be drawn, and in so doing compromised with the world unconsciously as Luther did deliberately. Grebel agreed with Calvin that the existing world order needed to be regenerated according to the will of God, but he differed in the method by which it was to be accomplished. He would separate the true Christian from the ungodly world order and its institutions, and resolutely abandon the use of the civil state even in its theocratic form to promote the Christianization of society, rather making the church a light to the world and a salt to the earth. The church should overcome the world by winning members from the ungodly society of the world to the godly society of the church. According to Grebel, the church has no right to seek to rule society from without or to attempt to control the civil authorities for the benefit of its interests. Rather it should probably expect to continue to be a "suffering church" in the world, as Christ promised His disciples, and never expect the mass of men to enter its portals or to adopt its way of life. However, within the boundaries of the church the will of God as found in the Gospel (not as found in the Old Testament ethic which for Grebel was of inferior value and certainly no longer valid for the Christian) was to have absolute sway. No Calvinist ever taught more rigidly the absolute sovereignty of God over the life of the members of the Christian community than Conrad Grebel and his brethren did. He resolutely refused to make the deliberate compromise with the world which Luther (and possibly Zwingli) made, or the unconscious compromise with the world which Calvin made. Grebel's absolutism did not make him a social revolutionary, although his program for the Christian was certainly radical for his time, and in fact is still radical for our day. He demanded absolute Christian nonresistance, the complete abandonment of the use of force and of the taking of human life. He was thus the first absolute Christian pacifist of modern times, except for Peter Chelčický of Bohemia, and most of his followers have maintained this principle to the present day. In taking this position, he found it necessary to deny the Christian the right to participate in the functions of the state, for the magistrates were compelled to use force and to take life since the state is ultimately based upon the sanction of force. Again, Grebel repudiated for the Christian the oppressive and unjust economic practices of his day, rejected tithes, and insisted upon the exercise of Christian brotherhood in economic relationships. It is not true, however, that his program included a communistic social order, although the emphasis upon genuine Christian brotherhood did lead to the establishment of pure Christian communism after a few years in one branch of the Anabaptist movement in Austria and Moravia, that known as "Hutterian Brethren." Conrad Grebel sought after reality in the spiritual life, a reality that was far removed from any mere externalism or legalism. He sought to generate and maintain a deep inner spiritual life through a living faith in Christ and a personal union with Him. He earnestly sought to make this inner spiritual life effective in the daily experience of the Christian believer, in trust in God for daily needs, in love toward the brethren, in separation from sin and the world, and in the life of holiness. He held that alone through incorporation with Christ and the brethren can the individual receive the strength necessary to live the Word of God, to conquer sin, and to maintain love. But by this strength, he and his martyr followers believed absolutely that the individual believer and the church as a whole would be able to bear victoriously "the baptism of temptation and testing," of persecution, suffering, and death, and "pass triumphantly through the testing by fire into the homeland of eternal rest" (quotations from the Müntzer letter). The most characteristic feature of Anabaptism, following inevitably from its concept of discipleship, was its insistence upon a new church of truly committed and practicing believers in contradistinction to the prevailing concept of the Volkskirche or inclusive church of the Reformation and subsequent periods held by Catholics and Protestants (Lutheran and Zwinglian) alike and maintained by the powerful patronage of the state, and to which, by birth and infant baptism, the entire population belonged. It was in the months between October 1523 and January 1525 that the battle between the two diametrically opposing views was fought out in the very heart of the Swiss Reformation. Zwingli, as Professor von Muralt has said, deliberately rejected the Swiss Brethren call for a church of true believers only and established "a church in which all professing Christians, the nominal, lukewarm, and indifferent ones as well as the really live and active Christians are kept together, a church to which the entire population belongs and which is not the church of genuine believers but only an imperfect human institution" (L. von Muralt, "Zwingli als Sozialpolitiker," Zwingliana V, 1931, 280). Luther and Calvin made the same basic decision, as did the leaders of the English Reformation, thereby establishing the "Volkskirche" as the official and general pattern for the whole of Protestantism. Only the Swiss Brethren (1525 on) and Dutch Mennonites (1533 on) at this crossroads of Christian history took the road of the free church of committed Christians, thus becoming the fourth major Reformation type. What personal significance has Conrad Grebel for the historic movement which he founded? The answer is chiefly that he made possible the initial and basic breakthrough. While it is true that during the troubled third decade of the 16th century others longed for and attempted the restitution of the New Testament ecclesia, that attempt became successful only under Grebel's leadership in Zürich. Historically the case is clear. The Swiss Brethren movement did begin in Zürich, and it did spread from there throughout Central and West Europe. It began in Zürich not only because Conrad Grebel and his associates clearly envisaged a voluntary Christian fellowship, a "gathered" free church of believers only, committed in earnest loyalty and holy discipleship to follow Christ under the cross and by His way of love, but because Grebel had the courage to make an unreserved personal commitment to this ideal regardless of consequences. To this commitment he held unflinchingly in the crucial moment when, in bitter determination to annihilate their ideas forever, all the power of church and state thundered down upon him and his small band of followers. Once the great and irrevocable step was taken, other faithful and noble spirits, including ultimately thousands of martyrs, followed in Grebel's train; but Conrad Grebel was the first Anabaptist. He performed the first adult baptism in Zürich in January 1525. He was the first to clearly mark the road away from Luther's and Zwingli's mass church into the free church of voluntary commitment, brotherhood, and full evangelical discipleship, of separation of church and state, and of freedom of conscience. Where others shrank from adoption of the full New Testament ideal because of fear that it could not be carried through in practice, as for instance Luther, Grebel acted. He chose to follow the vision without calculation of possibilities or practicalities, believing that the truth commands, it does not merely advise. For him the kingdom of God is to be built here and now in the fellowship of believers, in the beloved community of the disciples of Christ. This conviction was the sole ground for the existence of the Swiss Brethren brotherhood and later related groups. Unlike the other reformers, Grebel's is not a sharply delineated figure because of the brevity of his career, but his basic view of the essence of Christianity and the nature of the church is clear, and his place in church history is secure. That Grebel and his Swiss Brethren derived their faith solely and directly from the New Testament without any apparent literary or personal antecedents is one of the most striking things about the new movement. Every attempt to trace connections to earlier sources has failed, whether to the Waldensians or the Hussites as Ludwig Keller believed, or to the Franciscan Tertiaries as Albrecht Ritschl suggested. The Anabaptists were Biblicists and it was from the Biblical fountains that they drank. Having taken altogether seriously the sola scriptura of the Reformation, they were able to break more completely with the ecclesiastical and sociological forms of the Middle Ages and thus to return to the original ideas of the New Testament. In this spirit Grebel's followers once cried out, "You have Zwingli's word, but we want God's Word" (Habend it Zwingli's, wir wellend Gotts wort haben). For more than two decades after its writing, Harold Bender's biography of Grebel (1950) was read as the indisputable account. The following effort to update the Grebel historiography in the light of more recent revisionist writings will be restricted to a cursory review of seven of Bender's interpretations. By portraying Grebel as the chief founder of Swiss and South German Anabaptism, Bender presented a heroic progenitor of what has become the traditional, normative, theological vision of Anabaptist origins. Through the work of later historians, e.g., James Stayer (1975), Martin Haas (1975), Hans-Jürgen Goertz (1980), it is less evident that Swiss-German Anabaptism had a single source. A movement is an aggregate of people with a common cause in a variegated sociopolitical context, and the younger students of the Anabaptist movement are giving more attention to its contextual developments than to its so-called normative vision. Although Grebel was asked to perform the first rebaptism in Zürich, it was Blaurock who made the request; and in any case Reublin had already put a halt to infant baptism in his parish in Witikon and Castelberger had surely questioned the practice of infant baptism when he taught Paul's Epistle to the Romans in his pre-Anabaptist "school of the heretics" in Zürich. Before the Zürich baptismal event moreover, the writings of such German reformers as Karlstadt and Müntzer had had a profound impact on the Zürich radicals. Grebel surely had an early role in certain aspects of mentorship, but the development of the movement resulted from interdependent roles. Bender's theses were valid as far as they went: that Grebel was won by the powerful evangelical preaching of Zwingli, as were many citizens of Zürich, and that for a year and a half he was a zealous advocate of the Zwinglian reformation. What Bender failed to understand sociologically was the contextual functions of radicalism which the Grebel group performed in the Zwinglian movement and the complexity of the sociopolitical factors involved in the subsequent schism. From a behavioral perspective, Zwingli's attitude at this stage of his reformation was essentially radical in the sociological meaning of that term, i.e., favorable to fundamental change in the existing structures of one's social system. This need not imply that he was responsible for all of the actions of his most eager advocates, some of which caused problems for him as he steered the precarious course between tradition and change. On one hand he moved cautiously and no faster than he felt the system could move with him. But on the other hand, he, together with his advocates, prepared the way for change and then allowed events to come to a crisis. Heinold Fast portrays the Grebel group as Reformation storm-troopers, whose precipitous actions could advance Zwingli's cause at the same time that they could endanger it (Fast, 1975, 87). The nature of this precarious partnership can be observed in a sequence of demonstrations involving Grebel and other persons who were later participants in the Anabaptist separation. One was a preaching disturbance in the Dominican monastery by Grebel and three of his friends. In his attempt to play down Grebel's precipitous behavior, Bender wrote that "it is hardly possible that the four accused had been speaking against the monks [i.e. friars] from their pulpits, for they were laymen" (1950, 84-85). Following the review of these events by Goeters (1969), Fast (1975), and others, it now appears less unlikely that Grebel and his friends were doing exactly what the chronicler said they were doing, what Fast calls "reformation through provocation"—acts of pulpit-storming in which the ambiguous partnership with Zwingli is surely evident. Bender's claim above that Grebel's humanist education "made no evident contribution to his religious life or thinking" needs the corrective analyses found in articles by Robert Kreider (1952), Kenneth Davis (1974), and especially in Dale Schrag's dissertation (1984). With particular reference to Grebel's views of the believers church, discipline, ethical dualism, and biblical authority, Davis documents the probable substantive influence of Erasmus (Davis, 1973, 17071, 177). Bender's claim, moreover, that the pacifism of Grebel was fundamentally different than that of Erasmus deserves Schrag's criticism that Bender simply ignored most of the latter's writings on the subject. Erasmus was a thoroughgoing if not absolute pacifist; and his numerous writings on the subject are reflected not only in the teachings of Grebel's friend, Andreas Castelberger, leader of a pre-Anabaptist Bible study group, but in Grebel's letters to Vadian and Müntzer. To be sure, there were differences: Erasmus was a biblical realist and Grebel was a literalist. The theme of suffering nonresistance was not as dominant in Erasmus, although not absent either. Erasmus never left the Roman Catholic Church and preferred to work at reform from within and largely through renewal of biblical studies. In his ethical principles, however, Grebel was certainly closer to Erasmus than to Zwingli or Luther. For Bender it was sufficient to explain Grebel's roles as Zwinglian advocate and Anabaptist leader in terms of a profound religious conversion during the spring of 1522. More recently, revisionists examining the letters and documents have questioned Bender's rationalizations concerning Grebel's character with particular focus on the chronic hostility he expressed toward his parents. There is no indication that Bender was aware of the question now being posed: Can Grebel's radical commitment be explained in psychogenetic terms, i.e., displacement of unresolved hostilities toward authority figures? There is now a substantial body of psychoanalytic literature to support the theory of a causal relationship between radical attitudes and social-psychological factors such as the pattern of family relationships and the quality of one's self-identity in the community. From this perspective we would expect to find that hostility toward one's parents, even though repressed, will continue to seek expression and will be displaced in later life against the substitute representations of the parent role in the community. There is little doubt that the evidence in the case of Grebel fits this pattern, although it does not warrant the conclusion that Grebel's leadership in the movement was not therefore motivated also by valid spiritual concerns about the depravity he felt within himself and his family and community networks, and about the fundamental wrongness of the existing socioreligious order. But on the other hand, as Fast admonishes, "acceptance of Grebel's view of Christian faith does not ... require the rejection of the psychological and therefore thoroughly human substructure of the man" (Fast, 1982, 130). On the issue of social ethics, Bender's portrait of Grebel was further tailored to fit another aspect of Bender's "Anabaptist vision": the Christian's separation from the ungodly world order and its institutions and the regeneration of the world order not by direct involvement but by converting individuals from the ungodly society of the world to the godly society of the church (see above). Thus Bender could allege that in the township of Grüningen, where the soil was well prepared for the movement of the common people who had long been agitating for self-government and economic autonomy from Zürich and where Grebel had his most successful mission, "Grebel delivered a purely religious message" (1950, 154), a claim not substantiated by the documents. On one occasion, for instance, while preaching at Hinwil, Grebel alleged that Zwingli welcomed the peasants' march on Zürich so that they could be massacred by the authorities and that Zwingli had said that the Zürich authorities should cut off the heads of several of the tithe-resisting leaders so that the rest of them would think twice before refusing to pay their tithe (Harder, Leland, ed. The Sources of Swiss Anabaptism: The Grebel Letters and Related Documents: 415). These were assertions undoubtedly intended to appeal to the revolutionary mood of the people. A more balanced review of the sources on this subject is found in Werner Packull's article on " the Origins of Swiss Anabaptism in the Context of the Reformation of the Common Man" with its conclusions that Swiss Anabaptism had its genesis in the converging interests of urban radicals (Castelberger, Grebel, Mantz, and others) and rural reformers (Stumpf, Reublin, Brötli, and others) and that Swiss Anabaptism was at least a partial sequel to the social revolution of the common man (Packull, 1985, 54-59). Surely, both in his pre-Anabaptist sympathies with the rural antitithe protestors and in his later mission in Grüningen, Grebel was a persistent witness to the social as well as "purely religious" concerns, for as late as November 1525, during his prison interrogation, he was still proclaiming that Christians who were money-grabbers and usurers should, as taught in Scripture, be banned from the church (Harder, 1985, 439). Given the profound influence of Zwingli on the Grebel group in the pre-Anabaptist years, was the Grebel-Stumpf reform plan (Harder, 1985, 276-79) just another form of civic church based upon Zwingli's persistent vision of a corpus Christianum? While affirming that it was not a separatist sect-type vision, Bender interpreted the plan as the alternative to Zwingli's theocratic state-church: a free church congregationalism based on the separation of church and state. However, a number of scholars—Blanke (1961), Stayer (1975), Fast (1982), to name three—have drawn another conclusion about the plan, i.e., that it represented the very kind of civic church that Stumpf developed in his parish in Höngg, Reublin in Witikon, Brötli in Zollikon, Krüsi in Tablet, Reublin and Brötli in Hallau, and Hubmaier in Waldshut. Fast (1982, 126) writes that there were not two but three parts to the Swiss reformation: Zwinglian state churches, Anabaptist civic churches, and Anabaptist free churches. The third type cannot be dated prior to Grebel's letter to Müntzer, in which the free church principle was first enunciated. It was precipitated more by the growing persecution than by a theologically mature solution to the problem of church reform. There were still inconsistencies within the movement and Bender was either not fully aware or not willing to admit how multifaceted the movement was and how much its leaders alternated among and within themselves. In his acute frustration with the Anabaptists, Zwingli came to believe that they "do everything for the sake of contention" and that "their activity is nothing but heresy, that is sectarianism and partisanship" (Harder, 1985, 363). While there is substantial evidence to support that conclusion, Bender preferred to celebrate the Anabaptists' faithful adherence to the first principles of the Zwinglian reformation. His portrayal had therefore to assert that it was Zwingli who abandoned the original vision, a theory now known as "the turning point in the Zwinglian reformation." A review of the evidence by Hillerbrand (1962), Walton (1968), Goeters (1969), and others, while perhaps exaggerated in the opposite direction, surely proves that Zwingli's disillusionment with the radicals came earlier than Bender thought and was precipitated by their incorrigible impatience. Packull concludes that "if there was a turning point it was in Grebel and not in Zwingli" (1985, 43). Who then is to blame for the separation and violence that resulted from the dissension? This is Jean-Paul Sartre's question of good and bad faith, e.g., whether or not schismatics who rend the seamless coat of Christ as well as churchmen who kill their fellow Christians are held accountable for their actions. Most Zwingli scholars have absolved Zwingli of blame even though he used the instruments of violence to destroy his enemies. Mennonite scholars on their part have tended to overlook the provocations of the Anabaptists in order to lay the blame on the magisterial reformers. In the reassessment of the documents, would it be fair to say that neither side was without fault or blame? If we are reviewing the breakdown in communication, the answer is surely "Yes". But if we are talking about equal responsibility for religious persecution, the answer is surely "no." In fairness to Zwingli it must be asked how it was possible that he, with such a high view of Biblical revelation, could have resorted to such violence of word and deed, a question that Bender never asked. A number of fair-minded scholars have arrived at a common answer. Blanke wrote that "if Zwingli had accepted or supported the free church movement, the entire Reformation would have been smothered by the magistrates, and Zürich would have returned to Catholicism" (Blanke, 1957, 64). Leo Schelbert wrote that "Zwingli experienced the cruel alternative which is so common in that deadly game of rising ideologies. He either had to risk complete defeat of the truth as he saw it and to which his whole existence was committed, or he had to strike at . . . [his enemies] with ultimate force" (Schelbert, 1969, 63-64). This tragic dilemma was the main theme of the Zürich stage play, Brueder in Christo, written by the gifted Swiss playwright, Caesar von Arx (1947). Bender, Harold S. Conrad Grebel ca. 1498-1526, The Founder of the Swiss Brethren Sometimes Called Anabaptists. Goshen, IN: Mennonite Historical Society, 1950. Arbenz, E. and H. Wartmann. Die Vadianische Briefsammlung der Stadtbibliothek St. Gallen I-VII. St. Gall, 1888-1913. Arx, Caesar von. Brüder in Christo: A Drama in Three Acts. Zürich: Verlag Oprecht, 1947. Bender, Harold S. "Conrad Grebel, The Founder of Swiss Anabaptism," Church History 7 (1938): 157-178. Bender, Harodl S. "Die Zwickauer Propheten, Thomas Müntzer und die Täufer," Theologische Zeitschrift 8 (1952): 262-278. Blanke, Fritz. Brothers in Christ: The History of the Oldest Anabaptist Congregation. Scottdale, PA: Herald Press, 1961. Blanke, Fritz. "Anabaptism and the Reformation," in The Recovery of the Anabaptist Vision, Hershberger, Guy F., ed. Scottdale, PA: Herald Press, 1959: 57-68. Correll, Ernst and Harold S. Bender. "Conrad Grebel's Petition of Protest and Defence." Goshen College Record Review Supplement (September 1926): 33-37. Correll, Ernst, Harold S. Bender and Edward Yoder. "A Letter of Conrad Grebel to Zwingli September 8, 1517." Goshen College Record Review Supplement (September 1926): 33-36. Correll, Ernst, Harold S. Bender and Edward Yoder. "A Letter of Conrad Grebel to Andreas Castel-berger May 1525," Mennonite Quarterly Review 1 (July 1927): 41-53. Davis, Kenneth R. "Erasmus as Progenitor of Anabaptist Theology and Piety." Mennonite Quarterly Review 47 (1973): 163-178. Fast, Heinold. "Reformation durch Provokation: Predigtstörungen in den ersten Jahren der Reformation in der Schweiz." Umstrittenes Täufertum 1525-1975, Hans-Jürgen Goertz, ed. Göttingen : Vandenhoeck und Ruprecht, 1975: 79-110. Fast, Heinold. "Conrad Grebel: The Covenant of the Cross." Profiles of Radical Reformers, ed Walter Klaassen. Scottdale, PA: Herald Press, 1982: 118-131. Goertz, Hans-Jürgen. Die Täufer: Geschichte und Deutung. Munich: C. H. Beck, 1980. Goeters, J. F. Gerhard. "Die Vorgeschichte des Täufertums in Zürich." Studien zur Geschichte und Theologie der Reformation, ed. Luise Abramowski and J. F. G. Goeters. Neukirchen-Vluyn, 1969: 239-281. Haas, Martin. "Der Weg der Täufer in die Absonderung. "Umstrittenes Täufertum 1525-1975, Hans-Jürgen Goertz, ed. Göttingen : Vandenhoeck und Ruprecht, 1975:50-78, published in English as "The Path of the Anabaptists into Separation. "The Anabaptists and Thomas Müntzer, ed J. M. Stayer and W. O. Packull. Dubuque: Kendall/Hunt Co., 1980: 72-84. Harder, Leland, ed. The Sources of Swiss Anabaptism: The Grebel Letters and Related Documents, Classics of the Radical Reforma­tion, vol. 4. Scottdale, PA: Herald Press, 1985. Hillerbrand, Hans J. "The Origin of Sixteenth-Century Anabaptism: Another Look." Archiv für Reformationsgeschichte 53 (1962): 152-180. Kaufman, Peter L. "Social History, Psychohistory, and the Prehistory of Swiss Anabaptism." Journal of Religion 68 (1988): 527-544. Keller-Escher, Carl. Die Familie Grebel: Blätter aus ihrer Geschichte, ges. zur Erinnerung an die am 27. Okt. 1386 erfolgte Einbürgerung zu Zürich. Zürich, 1884. Knonau, G. Meyer von. "Konrad Grebel. "Allgemeine Deutsche Biographie. 56v. Leipzig, 1875-1912: IX, 619-622. Koehler, W. "Konrad Grebel. " in Die Religion in Geschichte and Gegenwart, 2.ed., 5 vols. Tübingen: Mohr, 1927-1932: II, col. 1435. Köhler, W. "Der Verfasser des Libellus Confutationis (Konrad Grebel)." Mennonitische Geschichtsblätter 3 (1938). Kreider, Robert. "Anabaptism and Humanism: An Inquiry into the Relationship of Humanism to the Evangelical Anabaptists." Mennonite Quarterly Review 26 (1952): 123-141. Muralt, Lonhard von. "Konrad Grebel als Student in Paris." Zürcher Taschenbuch auf das Jahr 1937. (Zürich): 113-136. Neff, Christian. "Conrad Grebel, Sein Leben und Wirken. "Gedenkschrift zum 400-jährigen Jubiläum der Mennoniten oder Taufgesinnten. Ludwigshafen, 1925: 65-133. Neff, Christian. "Konrad Grebel." Mennonitisches Lexikon, eds, Christian Hege and Christian and Christian Neff, 4 vols. Frankfurt & Weierhof: Hege; Karlsruhe: Schneider, 1913-1967: v. II, 163-199. Ninck, J. "Konrad Grebel." Arzt und Reformator Vadian. St. Gall, 1937: 109-119. Schelbert, Leo. "Jacob Grebel's Trial Revised." Archiv für Reformationsgeschichte 60 (1969): 32-64. Schmid, Walter. "Der Autor der sogenannten Protestation und Schutzschrift von 1524/25." Zwingliana 9 (1950): 139-149, which seems to prove that the December 1524 Protestation was not written by Grebel as W. Köhler and the editors of Zwingli Werke III, 368 ff., where it was published, assume, but probably by Felix Manz. Schrag, Dale R. "Erasmian Origins of Anabaptist Pacifism: A Case Study in Humanism and the Radical Reformation." MA thesis, Wichita State U., 1984. Staub, Max. Die Beziehungen des Täufers Conrad Grebel zu seinem Schwager Vadian: auf Grund ihres Briefwechsels : mit vier Beilagen. . . Zürich : Druck und Verlag von Ed. Leemann, 1895. Stayer, James M., Werner O. Packull, and Klaus Deppermann. "From Monogenesis to Polygenesis: The Historical Discussion of Anabaptist Origins." Mennonite Quarterly Review 49 (1975): 83-121. Stayer, James M. "Die Anfänge des schweizerischen Täufertums in reformierten Kongregationalismus. "Umstrittenes Täufertum 1525-1975, Hans-Jürgen Goertz, ed. Göttingen : Vandenhoeck und Ruprecht, 1975:19-49. Walton, Robert C. "Was There a Turning Point in the Zwinglian Reformation?" Mennonite Quarterly Review 42 (1968): 45-56. Yoder, Edward. "Nine Letters of Conrad Grebel, edited with a translation and notes." Mennonite Quarterly Review 2 (1928): 229-259. Yoder, John H. "The Turning Point in the Zwinglian Reformation." Mennonite Quarterly Review 32 (1958): 128-140. Zwingli, Ulrich. In Catabaptistarum Strophas Elenchus. Zürich, 1527, copy in Mennonite Historical Library (Goshen, Indiana, USA), a modern reprint in Huldreich Zwinglis Sämtliche Werke 6. Leipzig, 1936: 1-196 and an English translation in S. M. Jackson, Selected Works of Huldreich Zwingli. Philadelphia, 1901: 123-258, under the title Refutation of the Tricks of the Anabaptists. Bender, Harold S. and Leland D. Harder. "Grebel, Conrad (ca. 1498-1526)." Global Anabaptist Mennonite Encyclopedia Online. 1989. Web. 20 Apr 2019. http://gameo.org/index.php?title=Grebel,_Conrad_(ca._1498-1526)&oldid=146450. Bender, Harold S. and Leland D. Harder. (1989). Grebel, Conrad (ca. 1498-1526). Global Anabaptist Mennonite Encyclopedia Online. Retrieved 20 April 2019, from http://gameo.org/index.php?title=Grebel,_Conrad_(ca._1498-1526)&oldid=146450. Adapted by permission of Herald Press, Harrisonburg, Virginia, from Mennonite Encyclopedia, Vol. 2, pp. 566-575; vol. 5, pp. 354-356. All rights reserved. This page was last modified on 16 January 2017, at 07:28.